Last summer I created a plated dessert one night that involved chocolate profiteroles, honey ice cream, and roasted apricots. It was a pain because during service the freezer broke, and the honey ice cream was melting like crazy. Each mini profiterole had to be scooped and assembled to order, which took time, and that ice cream wasn’t getting any colder. It felt like that night would never end. But, I do remember that dessert fondly because there truly is something special about the flavors of chocolate, honey, and fruit coming together in one bite. Honey is such an incredible ingredient and as a pastry chef; a valued friend. I can’t even begin to count how many times honey has come to the rescue as the garnish for a plate or as a flavor inspiration. At the farmer’s market there is a guy who sells all different varieties of honey. Have you ever tasted the strong, bold buckwheat honey? Or detected the sweet floral hint in a local wildflower variety? I love it. The joy in experimenting with food and taste. A traditional strawberry shortcake- with a tender-crumbed scone, softly whipped cream, and sweet strawberries is hard to beat. If you do, however, choose to venture off the beaten path, then this is a savvy solution to changing things up. This recipe for chocolate scones is fantastic. They have a moist, cake-like texture and are not too sweet. Split and filled with succulent, honey whipped cream and fresh summery strawberries, these shortcakes are sassy and refreshing. If I were to make these again, I would even add a few cracks of fresh black pepper to the chocolate scones before baking them. But that’s just me. Preheat your oven to 375 F. Line a baking sheet with parchment paper. Combine the chocolate chips, cocoa powder, and sugar in the bowl of a food processor fitted with the metal blade. Pulse repeatedly until the chocolate is finely ground, taking care not to over-process so the chocolate doesn’t melt. Add the flour, baking powder, and salt and pulse several times to mix thoroughly. Add the butter and pulse until it is finely mixed and the mixture resembles cornmeal. Alternatively, you can also do this with a pastry blender and some good ole fashioned elbow grease. Using a fork, beat the egg and milk together and add to the dough. Pulse 3-4 times until incorporated. Invert the bowl onto a floured surface and carefully remove the blade. Fold the dough over on itself several times to give it a final mixing. Roll the dough to 1¼″ thickness. Use round cutters to cut out approximately 10 scones. You may need to gently press the scraps together and pat out the dough again. 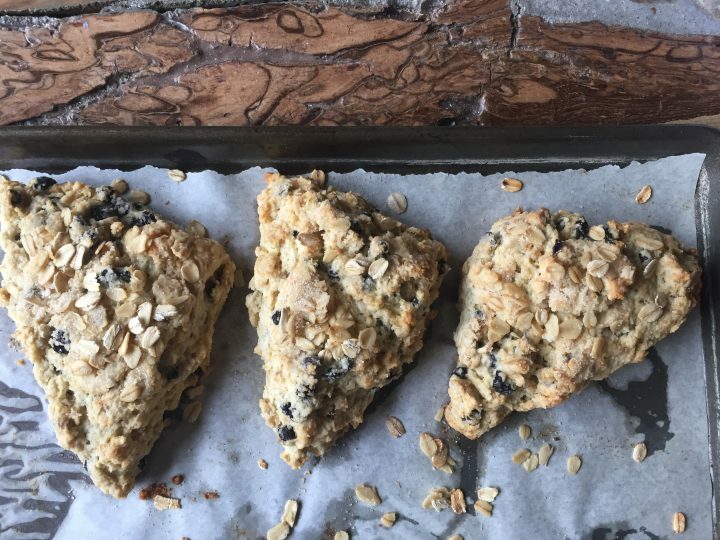 Arrange the scones on the prepared baking sheet. Brush the tops with a little milk and sprinkle with sugar and chocolate chips, if desired. Bake the scones until they are well-risen and firm to the touch, about 15 minutes. Let cool completely before assembling into shortcakes. In the bowl of an electric mixer, whip the cream and honey together until soft peaks form and the cream holds its shape. Stem and cut the strawberries into quarters. Taste them and see if they need a touch of sugar. Toss with sugar and let them sit for at least 10 minutes. Split each chocolate scone in half and spoon some honey whipped cream onto each bottom half. Top with some sliced strawberries and cover with the top half of the scone. Enjoy immediately. Makes approximately 10 shortcakes. Note: This recipe is adjusted for high altitude baking. To make at sea level, increase flour by 1/3 cup and baking powder to 3 teaspoons. These are lovely. And, yes, there is something special about chocolate, fruit and honey. It’s a near perfect bite.